The traditional Bouvier design by Thomasville is a designer print that features select scenes from a herder's diary. The images are sketched in black to mimic the original charcoal drawings. They are set on an cream background to recreate the look and feel of a sketch. Rod Pocket Drapery is fully lined in off white and is sold in pairs measuring 100 inches wide (two 50 inch wide panels) by 84 inches long. The rod pocket is 3 inches with a 2 inch header. A 2 1/2" wide Continental Rod is perfect for hanging. For a colorful Mediterranean bring the Tuscany Window Curtain Panels into your home. 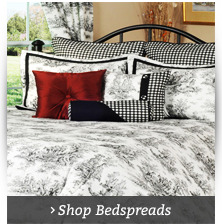 It features a lovely Ikat print on woven 100% Polyester Pebble Beach Base fabric. The pair measures 70 inches wide by 63 inches long, measured from top stitch of rod p ocket. Panels have a three inch rod pocket and no header. Not lined, imported. Machine washable. Hydrangea is a gorgeous medium scale pattern design in blue. Made in the USA of 100% Cotton 7 ounce duck cloth. The pair measures 68 inches wide and comes in lengths of 54, 63, 72, and 84 inches. Tie backs are included, rod pocket is 1-1/2 inch and header is 2-1/2 inches. 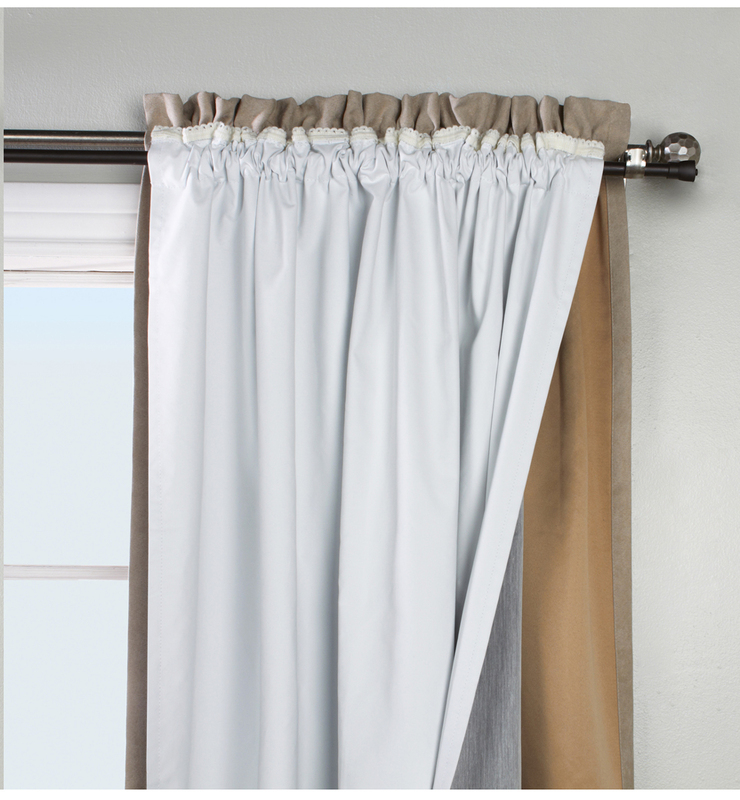 Use a one inch diameter curtain rod hanging. 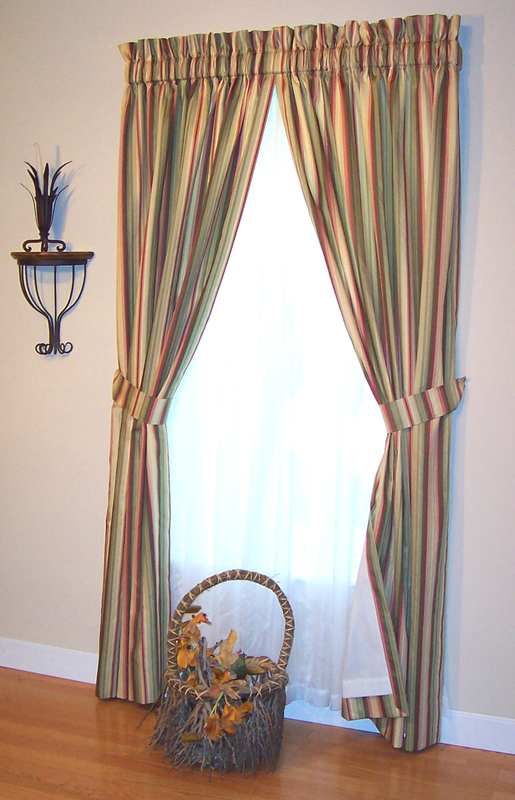 Made here in North Carolina, it's your opportunity to mix and match beautifully crafted Swags with matching or coordinating Rod Pocket Curtain Panels. Add some toss pillows to complete your designer inspired custom look. Rod pocket panels measure 50 inches wide in your choice of 84 or 96 inches. Longer panels can be custom ordered. Each panel features a 4-inch rod pocket to fit a 2-1/4 inch diameter decorative wood rod. Fully lined in high quality white lining material. The Two Piece Swag Pair measures 100 inches wide by 30 inches long measuring from top of "header". It has a 3 inch rod pocket, 2 inch header, and is fully lined in high quality white lining material. 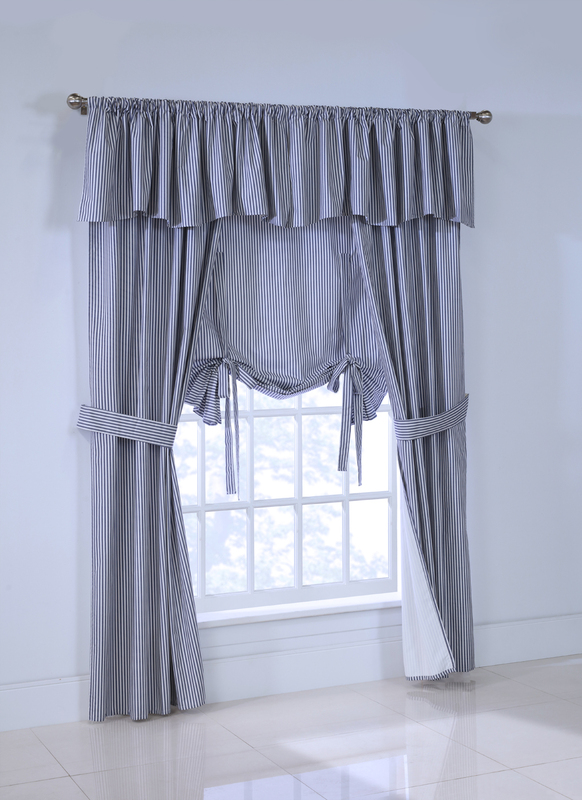 The Straight Corded Valance measures 100 inches wide by 16 inches long including the 2 inch header. Rod pocket is 3 inches and is self corded and fully lined. Decorative Toss Pillow has self cording on all sides and measures 17 x 17. Fabric is the same on front and back of pillow. The pair measures 100" wide (two 50" wide panels) by 84 inches long, and is fully lined, with a 3 inch rod pocket and two inch header. Allow two times your rod width for proper fullness. Use a 2 1/2 inch continental rod for hanging. Fabric is cotton and is made in the USA. 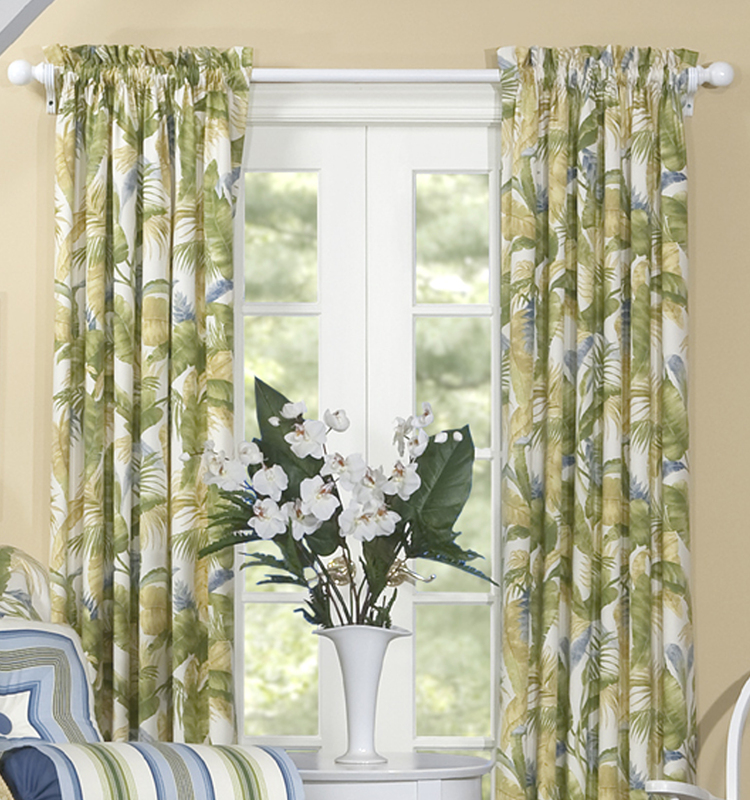 The La Selva Natural tropical print pattern from Thomasville includes a line of curtains, valances, bedding, throw pillows and other home décor accents. The lush print features a tropical picture of palm leaves and bird of paradise blooms and leaves in muted greens, golds and salmon reds over a beige background. The pattern is printed on cotton duck fabric, and made in the U.S. 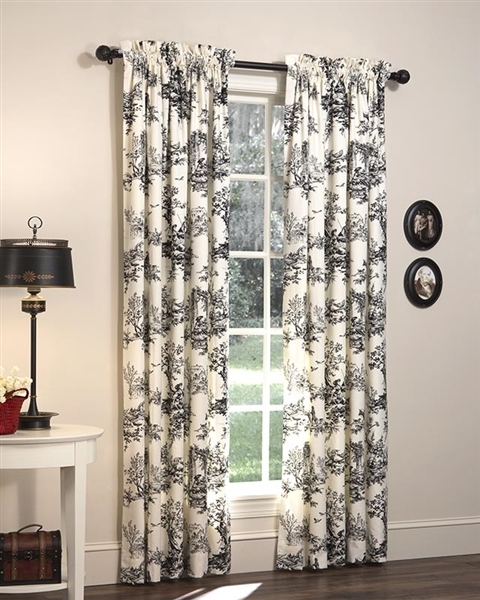 The paired curtains measure 50-inches wide, for a total 100-inches in width by 84-inches in length. 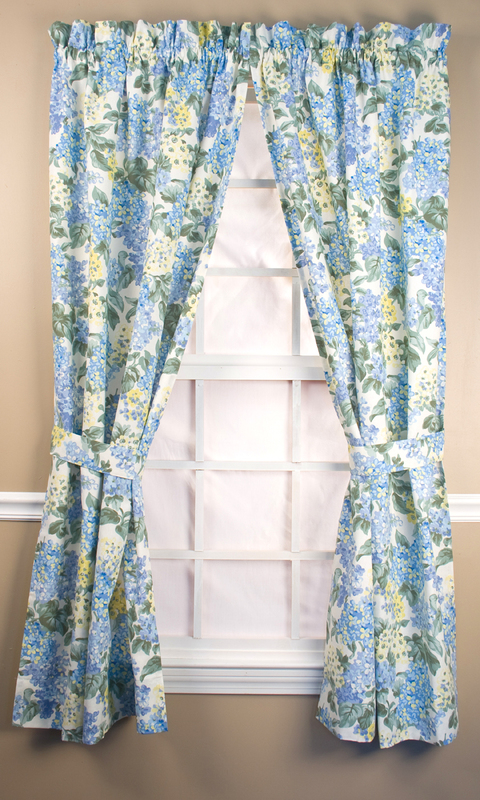 The curtains are fully lined and have a 3-inch rod pocket and 2-inch header. 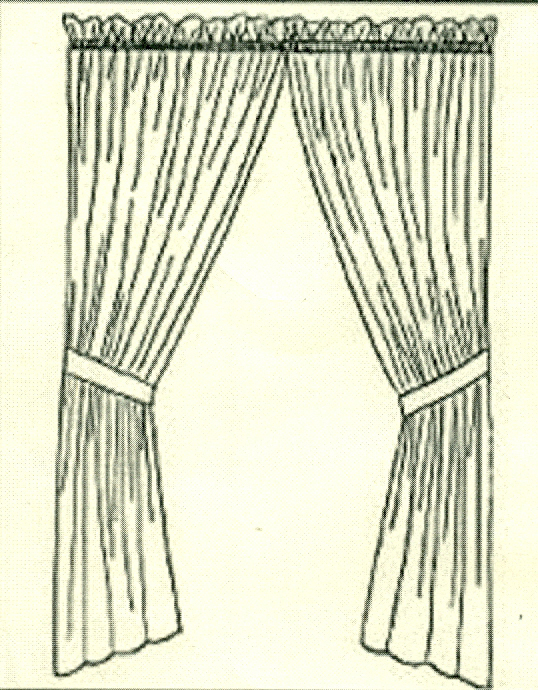 The curtains take a 2 1/2-inch continental rod for hanging. 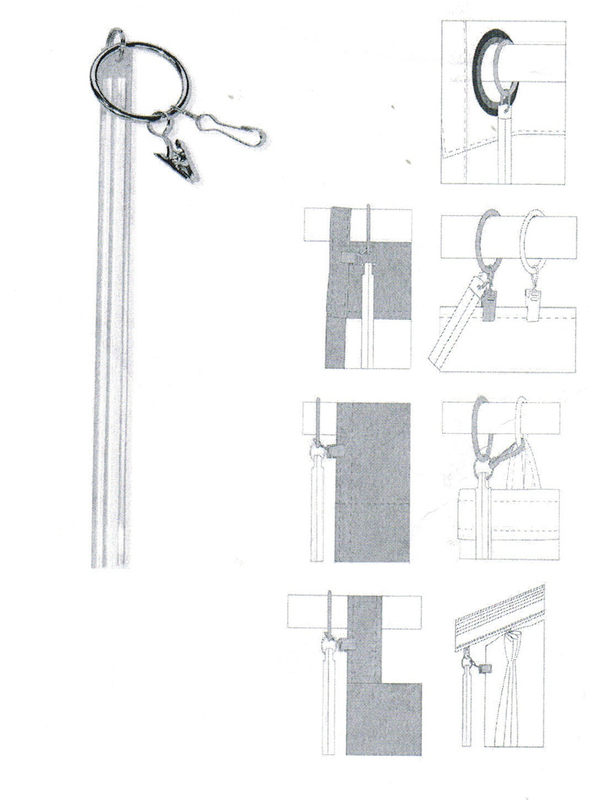 It is recommended to allow two-times of curtain width for the rod width to allow for proper fullness. 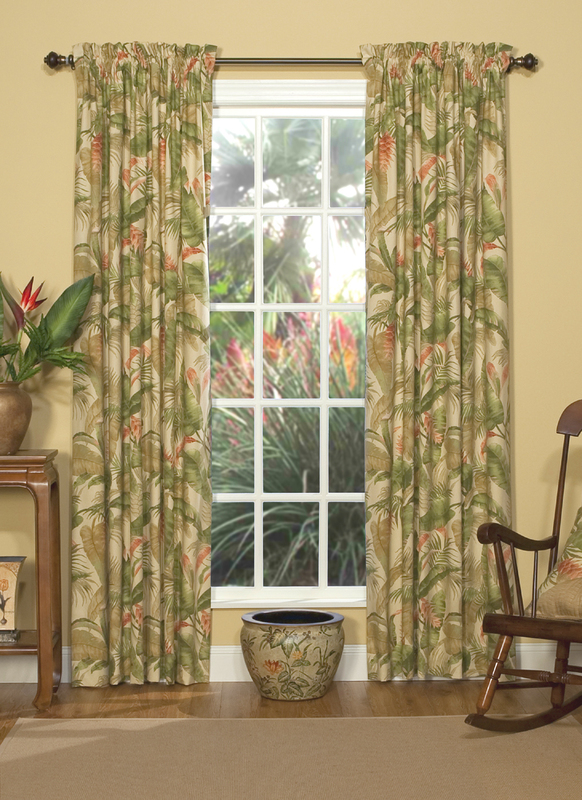 The La Selva curtains can be paired with La Selva valences, bedding, throw pillows and other home décor accents. 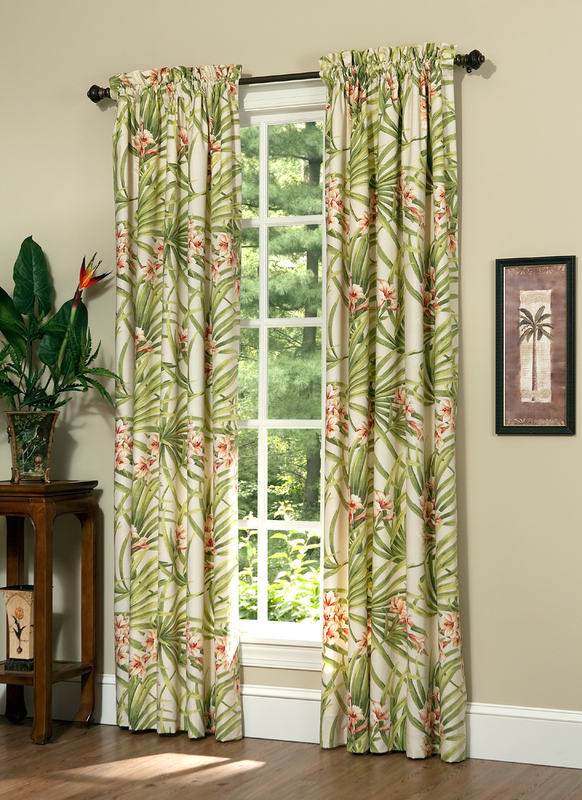 Bring the lushness of the tropics into your home with the La Selva curtains with a tropical print over a black background from Thomasville. 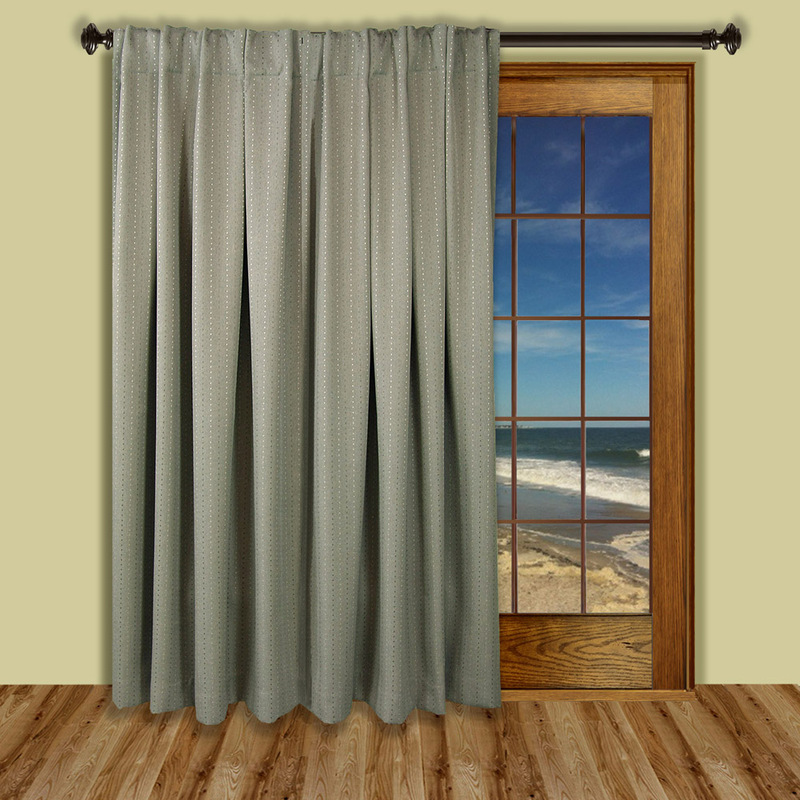 The 84-inch rod pocket curtain pair has a combined 100-inch width, with two 50-inch panels and a length of 84-inches. The long curtains can cover tall windows, or elongate smaller windows with a floor-length hang. 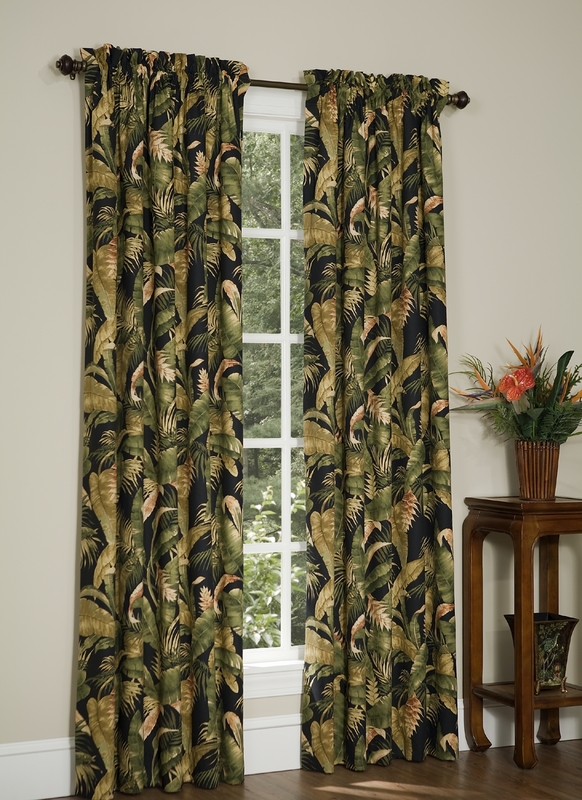 The cotton curtains have a tropical print of palm and fern leaves, other tropical leaves and bird of paradise floral blooms throughout, growing against a black background. 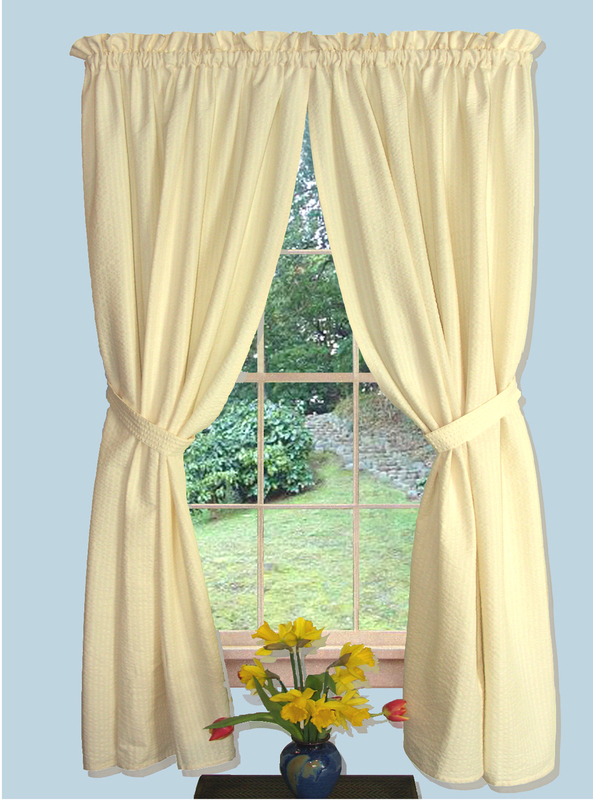 The curtains are fully lined, and have a 3-inch rod pocket and a 2-inch header. 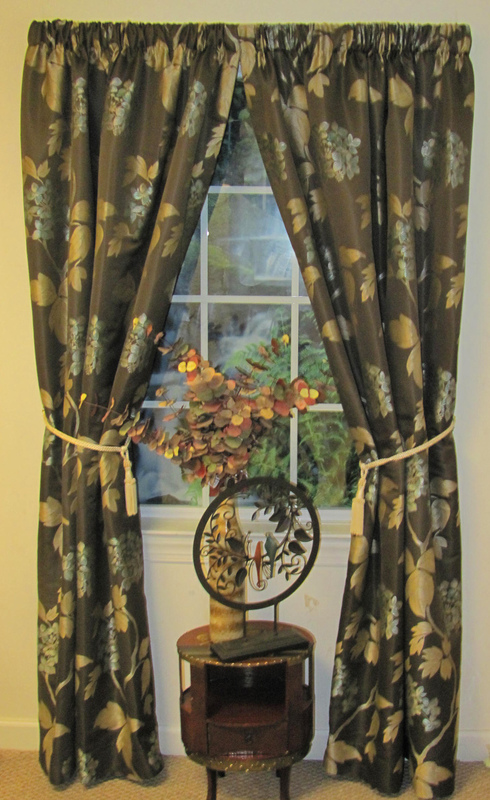 The curtains are best when hung with a 2 1/2-inch continental rod. Allow two times the rod width for proper fullness. The curtains are made in the USA. Rod pocket panels measure 50 inches wide in your choice of 84 or 96 inches. Longer panels can be custom ordered. Each panel features a 4-inch rod pocket to fit a 2-1/4 inch diameter decorative wood rod. Fully lined in high quality white lining material. Many custom options in our Almost Custom program including size and rod pocket change, insulated or black out lining, plus pinch pleats and grommet top panels are also available. 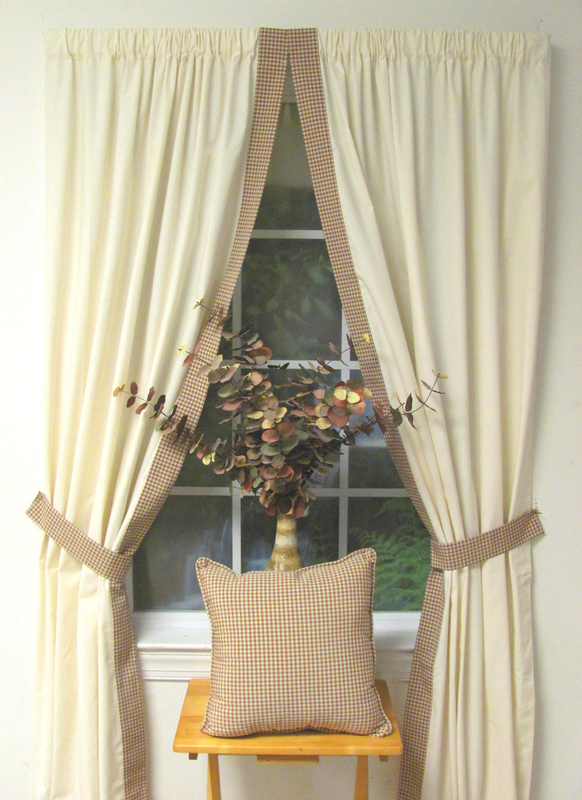 Valances and Toss Pillow to match or coordinate is available in our Almost Custom program. Toss Pillow has self cording on all sides and measures 17 x 17. Fabric is the same on front and back of pillow. Thermalogic Ultimate Black Out Liner is an energy efficient insulated curtain panel. Warm air stays in during winter, cool air stays in during summer. Get a more restful sleep thanks to its room darkening characteristics. Plus, it saves money on your energy bill, acts as a sound barrier so you can enjoy more peace and quiet, reduces glare on computer monitors and TV screens, protects carpets and furniture from sun fading, and it is white on the back side to meet condominiums requirements. Each panel has 1/2 inch side hems and 1/2" bottom hem, and includes simple to follow instructions. 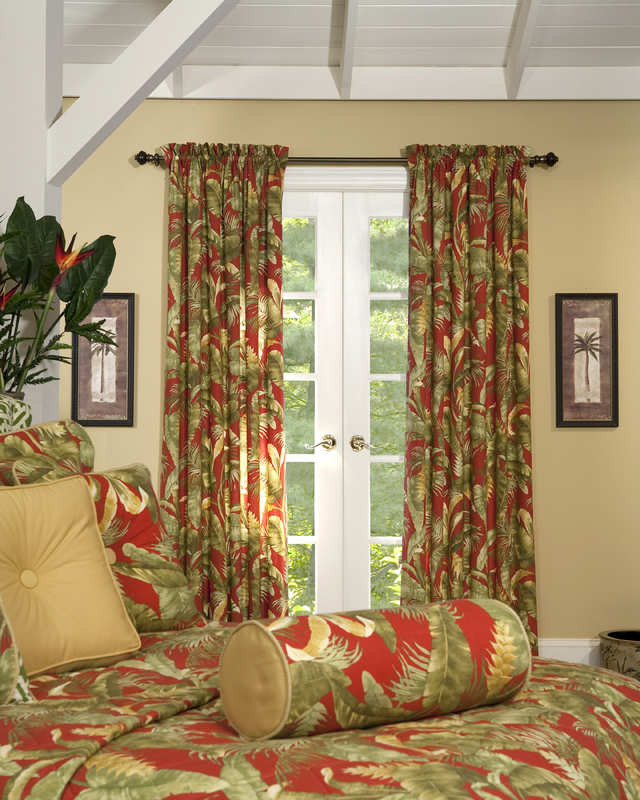 Captiva, with its a tropical allure, features green tones and gold on a deep red ground. The pair measures 100" wide (two 50" wide panels) by 84 inches long, and is fully lined, with a 3 inch rod pocket and two inch header. Allow two times your rod width for proper fullness. Use a 2 1/2 inch continental rod for hanging. Fabric is Cotton and is made in the USA. 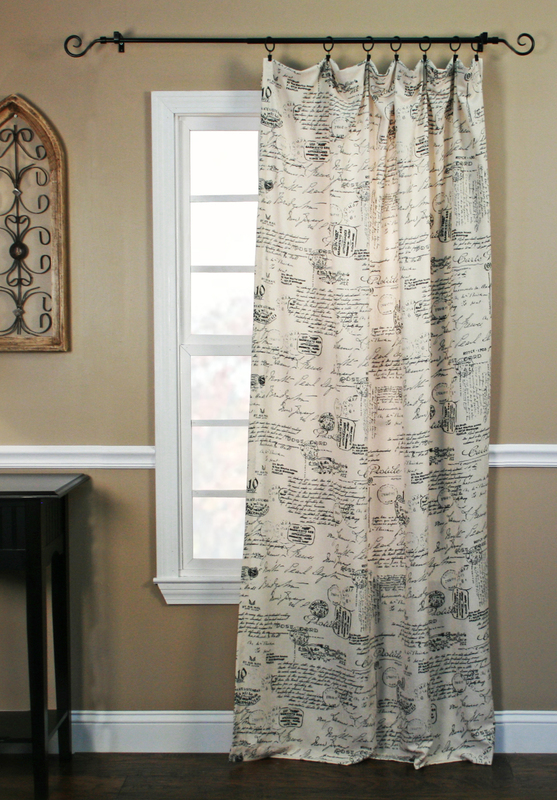 Attractive light and airy rod pocket curtain panel featuring black writing on a crushed taffeta ground in Natural. Measured from top stitch of rod pocket down. Dimensions: 68"W x 72"L (two 34" wide panels). 1 1/2" rod pocket 2" header, not lined. Includes tie backs. Omaha Tailored Panel is packaged and sold individually. Use two panels to accommodate a standard single window. 1 1/2"" rod pocket, 2" header, not lined. 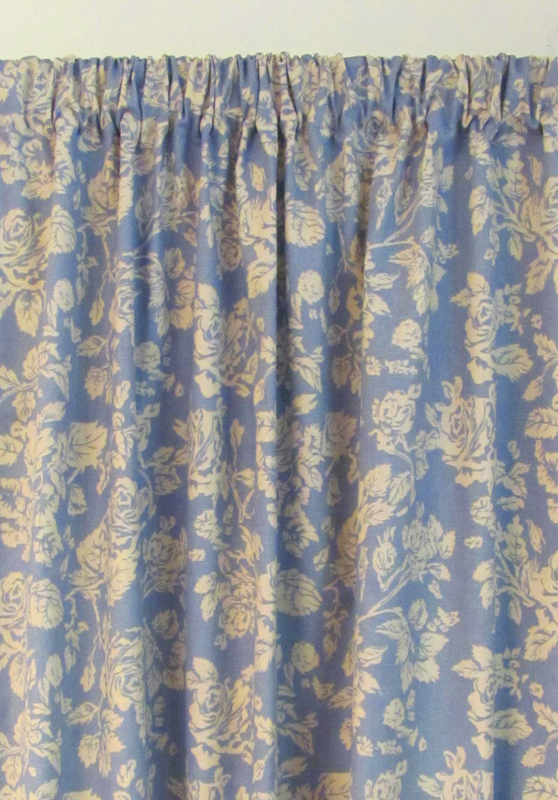 Victoria Park Toile in the true French Country tradition is a 100% cotton print fabric. Add country elegance to a any room in your home for a casual country feel. 100% Cotton 7 ounce Duck, dry cleaning is recommended. 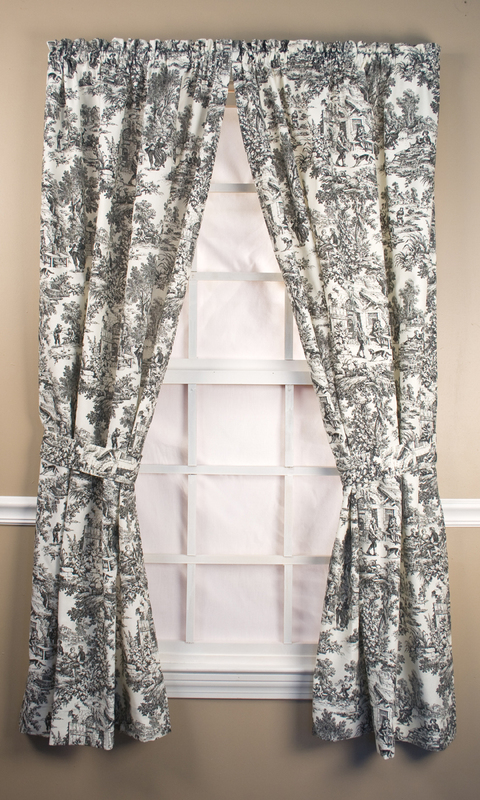 Scalloped Valance is not included. A luxurious heavy weight tone on tone jacquard which is woven in an all over leaf motif using shiny and dull yarns to achieve increased depth and interest. Enhanced even more with a lovely printed multi-colored scrolling floral design. 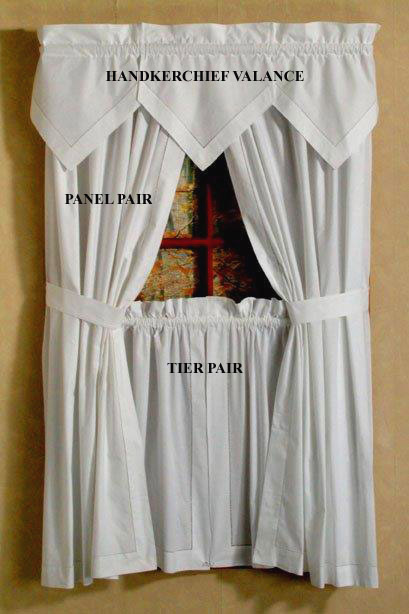 Note, photo illustrates two Tailored Panels with a Scalloped Valance. All components, including panels, are sold separately. A deluxe heavy weight tone on tone jacquard. The Tailored Panel is woven in an all over leaf motif using dull and shiny yarns for depth and interest. Colors: Blue, Chocolate, Latte, Sage, Wine, White, Navy, and Ivory Fabric content: 100% Polyester 3" rod pocket, 1 1/2" header. Machine wash, warm water, gentle cycle. Do not bleach. Line dry. Warm iron as needed. Imported. Dimensions: 52"W x 63"L Panel is sold individually, one per package. Deluxe heavy weight tone on tone jacquard tailored panel is woven in an all over leaf motif using shiny and dull yarns for depth and interest. It is accented with a printed stripe motif. The matching scallop valance is finished with a self fabric cording along bottom edge. 3" rod pocket 1 1/2" header, not lined. Dimensions: 52"wide, lengths in 63" and 84". Photo illustrates two Tailored Panels and two Scallop Valances. Components are sold individually. Machine wash warm water, gently cycle. Do not bleach. Line dry. Warm iron if needed. Panels are 52" wide and offered in lengths of 63" and 84"
This shimmering textural woven jacquard tailored panel is an all over floral motif and is created by lustrous yarns of varying textures and heights. All components are unlined and have a deluxe 3 inch rod pocket. Use a 2 1/2 inch continentail rod for hanging. 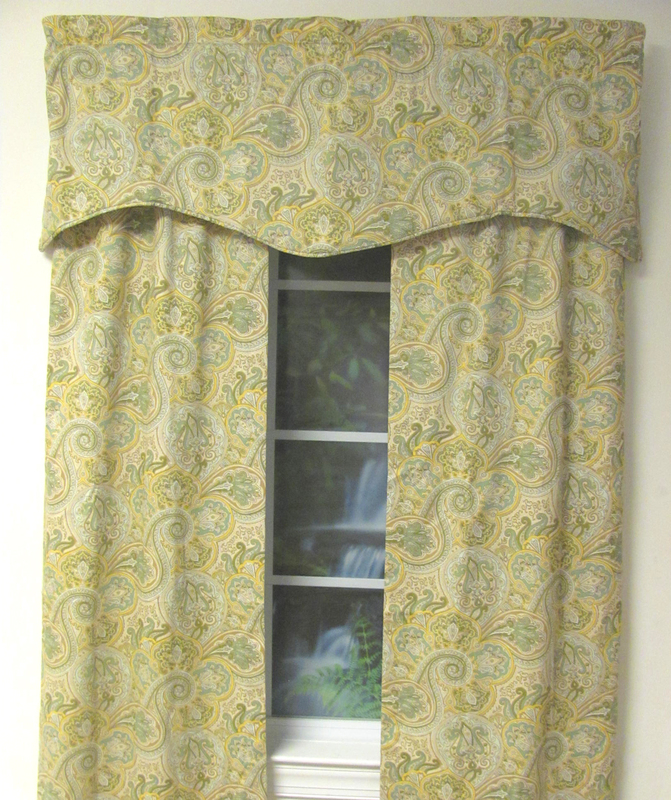 Photograph illustrates two panels and three Water Fall Valances, each component sold separately. Choose from four luxurious colors: Sage, Ivory, Cocoa, and Brick. Arctic Blue, featured in photograph has been discontinued. Machine wash, warm water, gentle cycle. Do not bleach. Line dry. Warm iron if necessary. Audrey is a pretty floral fabric design with butterflies. 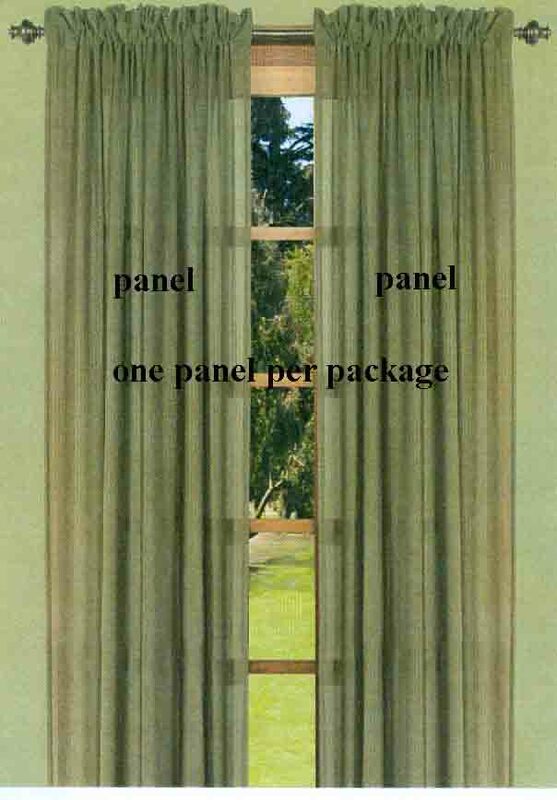 Panel pairs are 68" wide, two 34" wide panels with tie backs. Lengths are offered in 54", 63", and 84" in limited quantities. Please do not exceed product's availability. 1 1/2" rod pocket 2 1/2" header. Made of 100% Cotton. Dry clean recommended. Sweet William Rod Pocket Panel Has a 3" rod pocket, 2" header and is not lined. Panel is 50" wide and is offered in 72" and 84" lengths. 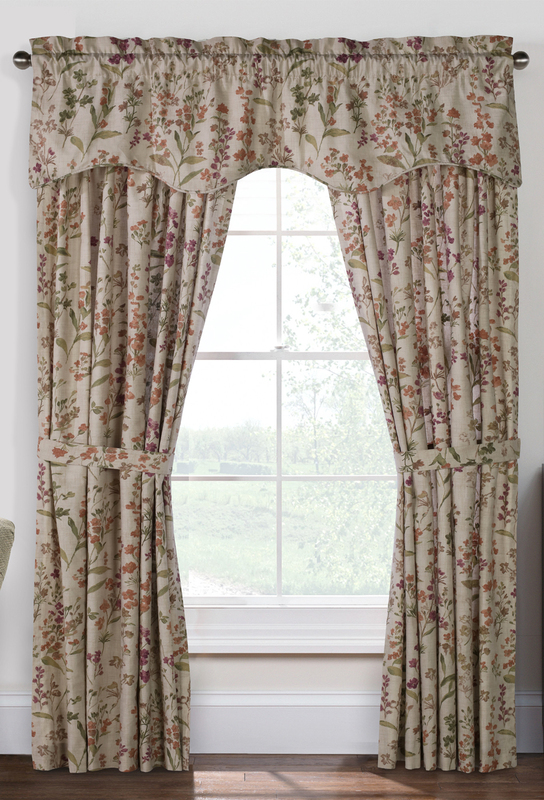 Additional sizes plus lined panels are available in our Olde Towne Almost Custom program. Brissac's colorful Jacobean Print will liven up any room in your home. This unlined tailored pair features a three inch rod pocket with no header. The pair measures 70 inch wide (two 35" wide panels) and is offered in 63 inch length only. It's a great value and economically priced, made of 100% Polyester Pebble Beach base cloth and is machine washable. Imported. Botanical is a pretty multi colored garden floral design featuring a very light ivory ground embellished with red and blue floral tones and greenery. Each panel has a 1 1/2 inch rod pocket and 1 1/2 inch header. This lightweight unlined fabric gently filters light and provides an element of privacy. Each panel is 48 inches wide and come in lengths of 63 and 84 inch. It's made of 100% Polyester. Dry cleaning is recommended. Imported. 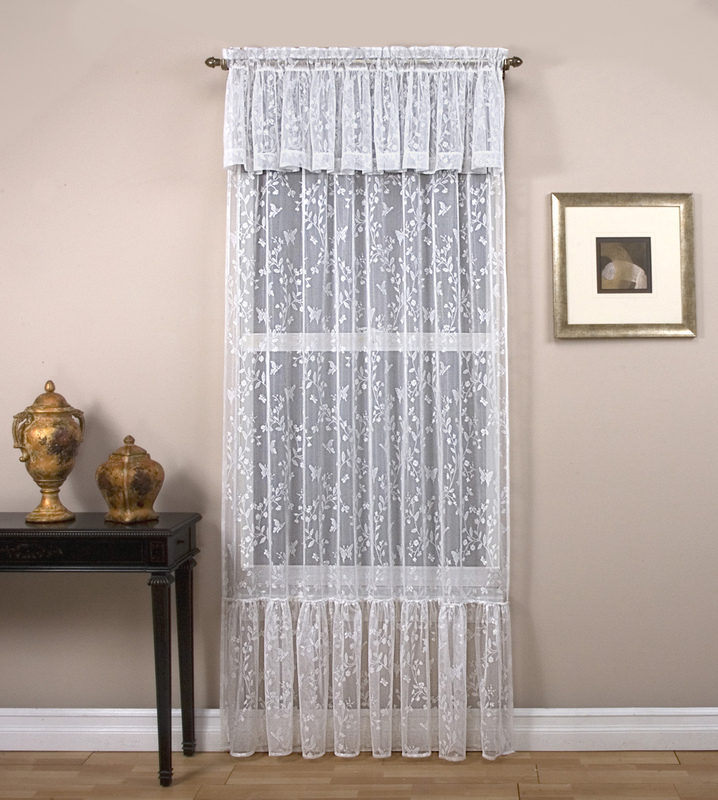 Elegant Anna Thermalace lace insulated rod pocket curtain curtain pair, by Commonwealth Home Fashions, is a beautiful pair of jacquard lace curtains. Matching thermal lining makes this beauty both decorative and functional, retaining heat in the winter and cool air in the summer, thus lowering your energy costs and keeping you comfortable all year. Each panel is 52" wide with a 3 inch rod pocket, two inch header, 1 inch side hems, and 3inch bottom hem. Lining is attached on three sides and is color matched. 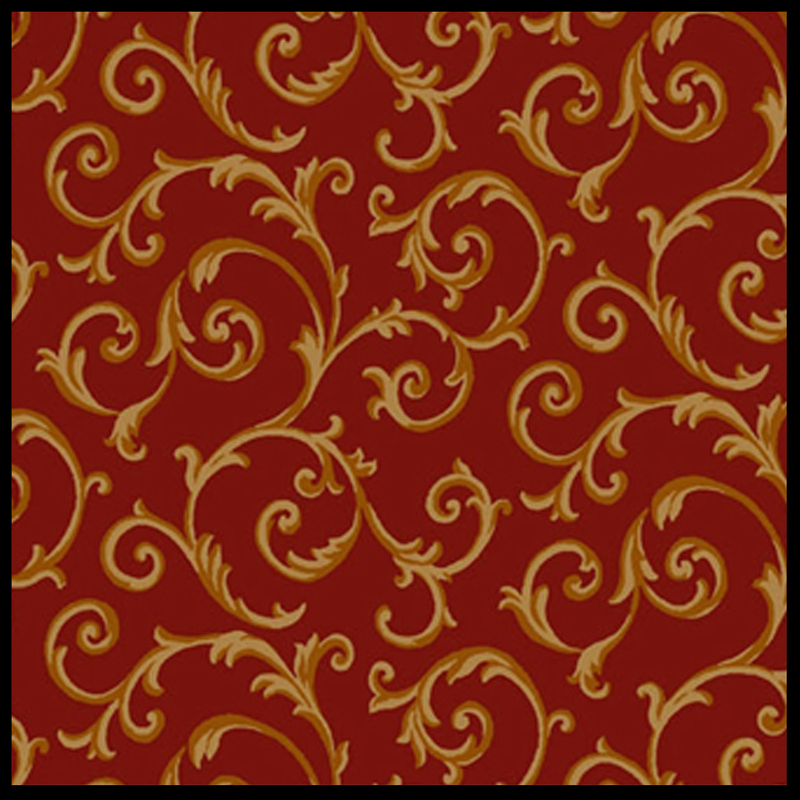 Fabric Content is 100% Polyester for both face and lining. Machine wash on gentle cycle in cold water and line dry. Select color in Mushroom, Ivory, or White. Made in America, and fully lined in white with a three inch rod pocket and no header. These narrow panels are 26 inches wide and are perfect for adding a little color on each side to beautifully accentuate your window. Corners are weighted. Valance is sold separately. 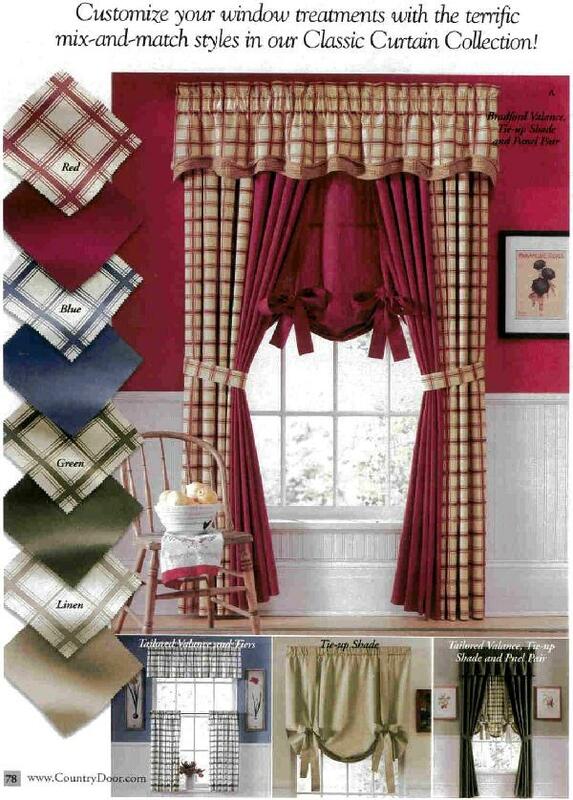 Natural 100% Cotton Duck Drapery is trimmed in the traditional check pattern, Colburn. Sold in pairs, they measure 84 inches long. Colburn Tie backs are includes. 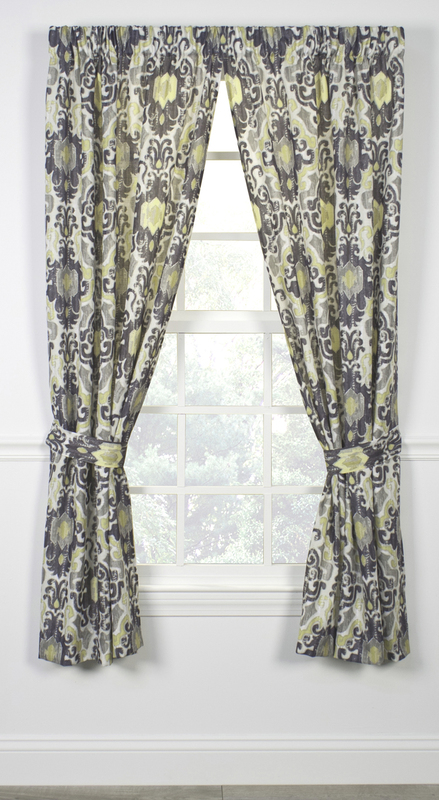 Match this lovely with a swag or other valance style in Colburn. Charcoal is lovely black and tan check pattern on a Natural main fabric. Cayman, with its a tropical allure, features subtle tones of green and blue on an ivory ground. The pair measures 100" wide (two 50" wide panels) by 84 inches long, and is fully lined, with a 3 inch rod pocket and two inch header. Allow two times your rod width for proper fullness. Use a 2 1/2 inch continental rod for hanging. Fabric is cotton and is made in the USA. Dimensions: 70" wide to the pair. 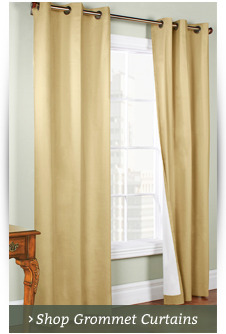 Cafe Tier Curtains are offered in lengths of 24, 30, and 36 inches. Cafe Tier Curtains do not have tie backs. 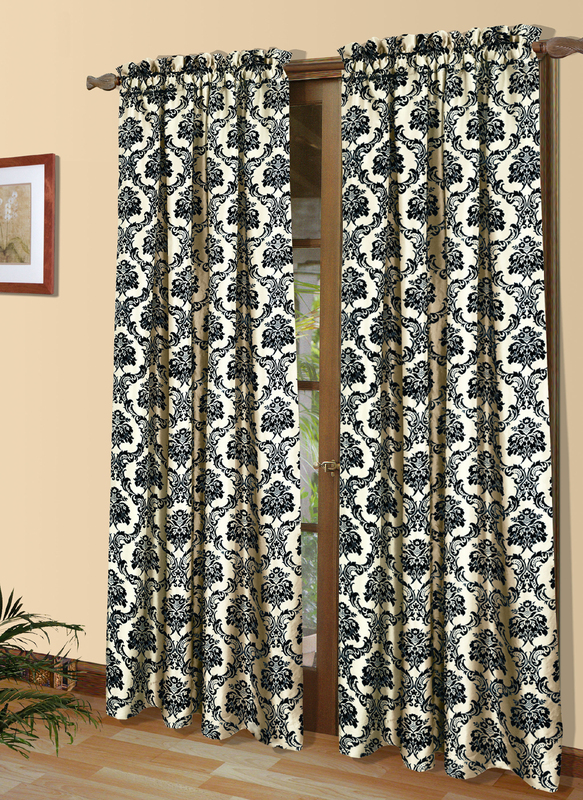 One 63"L Curtain Pair including tie backs are available. 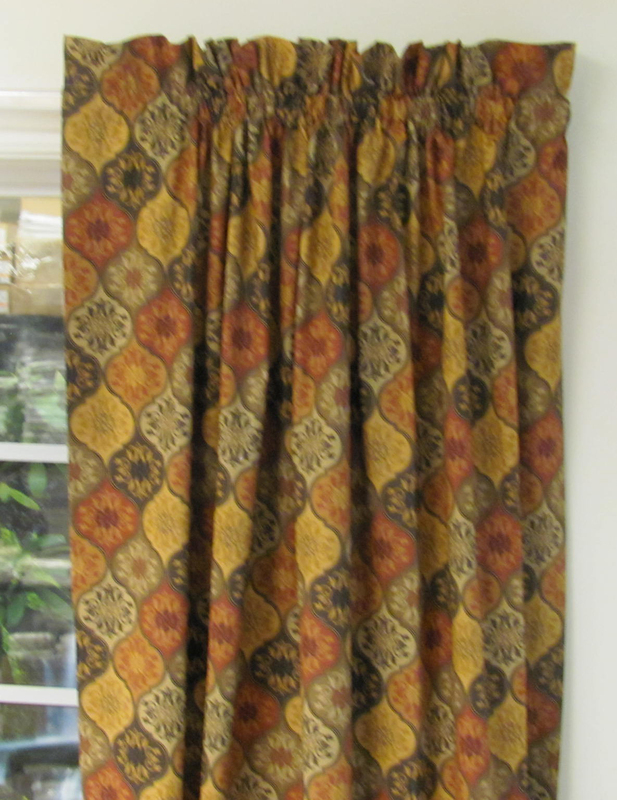 One Straight Valance (not shown in photograph, measured 70"W x 12"L. It's a basic 100% cotton pair of curtains measuring 70 inches wide (two 35 inch wide panels). This attractive unlined pair has the texture of an artist's canvas. Each panel is embellished with a pretty lace band that is two inches wide. Tailored panels have 1 1/2" rod pocket, and 1" header. One pair fits a standard single window. The Crescent Valance (shown in photograph) is sold out. Cozumel, with its a tropical allure, features subtle tones of green and orange on an ivory ground. The pair measures 100" wide (two 50" wide panels) by 84 inches long, and is fully lined, with a 3 inch rod pocket and two inch header. Allow two times your rod width for proper fullness. Use a 2 1/2 inch continental rod for hanging. Fabric is cotton and is made in the USA. Rod Pocket Panel is sold one panel per package. 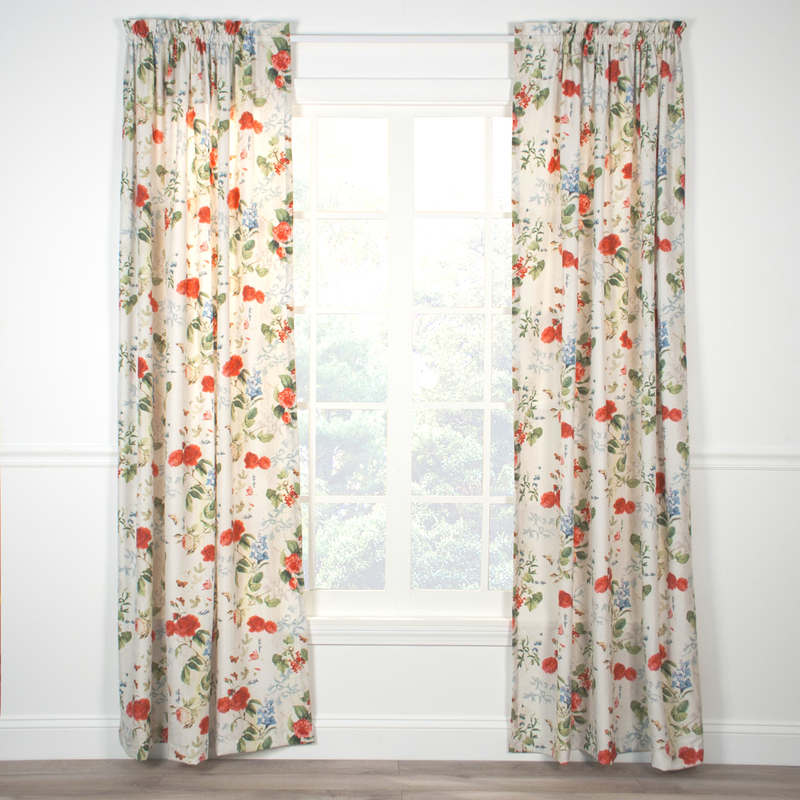 Add Blue accents to your home with Federal Floral curtain panels with their beautiful floral pattern over a rich red background. 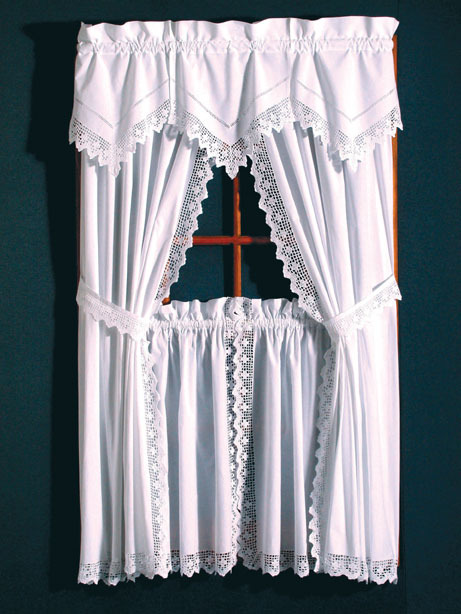 Each rod pocket panel is 42 inches wide and 63 inches long with a generous 3-inch rod pocket to insert standard or embellished curtain rods. 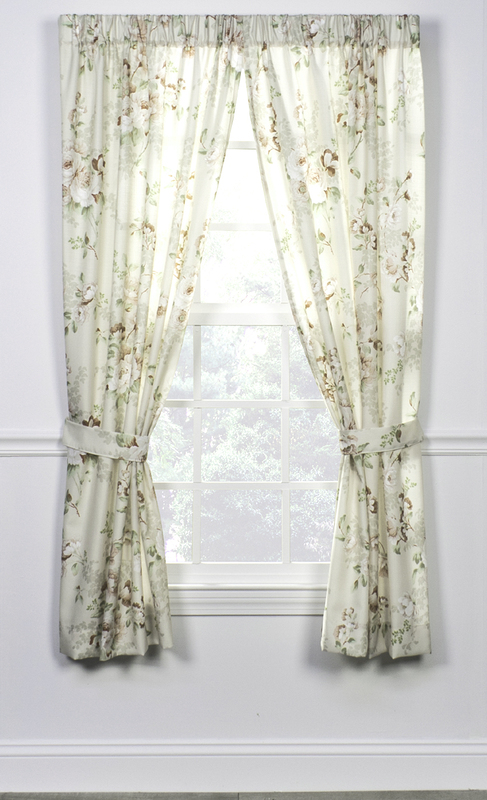 These fully lined Federal Floral curtains by Ricardo Trading are crafted of 100 percent premium cotton. 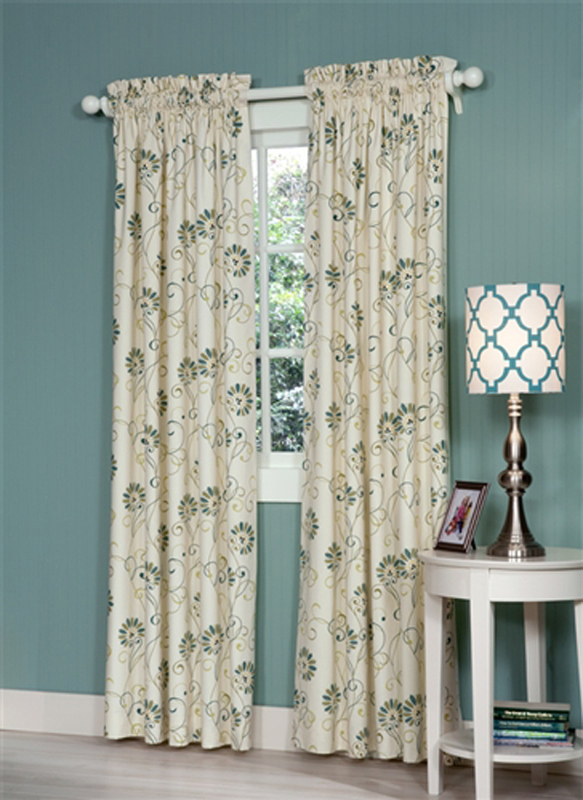 It's a gorgeous look from our always affordable window treatment collections at The Curtain Shop. 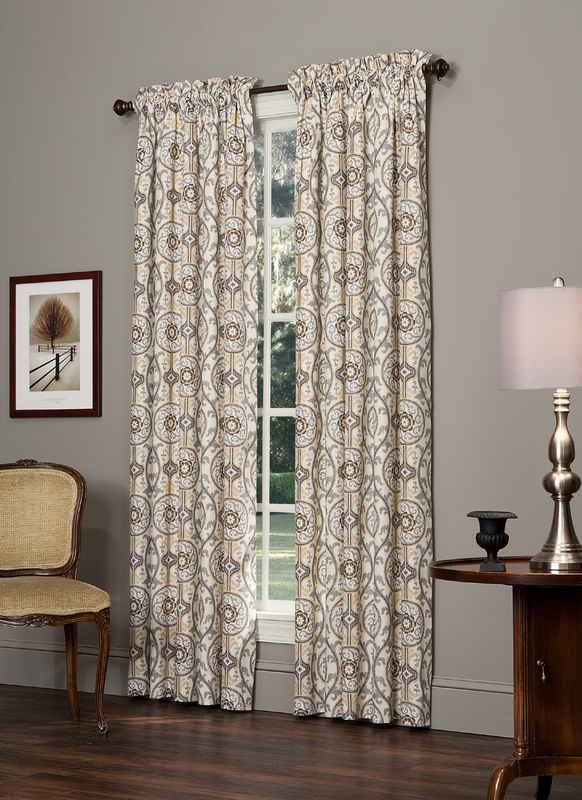 Embossed medallion pattern in a woven jacquard makes the Belgique Thermalogic Curtain Panels look rich and elegant. Insulated with room darkening properties, Belgique is the perfect selection for any room in your home. Made of 100% Polyester with white backing and washable, this easy care drapery, offered in three solid colors, helps to reduce cooling and heating costs. Each panel, sold individually, has a dual header, thus can be hung with the 7 back tabs for a sleek pleated look, or the 3 inch rod pocket for a traditional gathered appearance. Each panel is 50 inches wide and comes in lengths of 84 and 95 inches. Side hems are 1 inch and bottom hem is 3 inches. Select colors of Parchment, Burgundy, or Espresso. Everything goes one one single curtain rod! 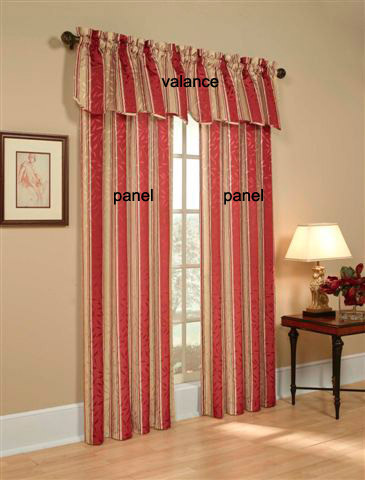 The set includes two panels, two tie backs, and one valance. Features include a 3 inch rod pocket, no header, 1/4 inch side hems and bottom hem. Simple to hang, and easy to maintain. Made of 100% Polyester on the face, with a 100% Rayon on the back. 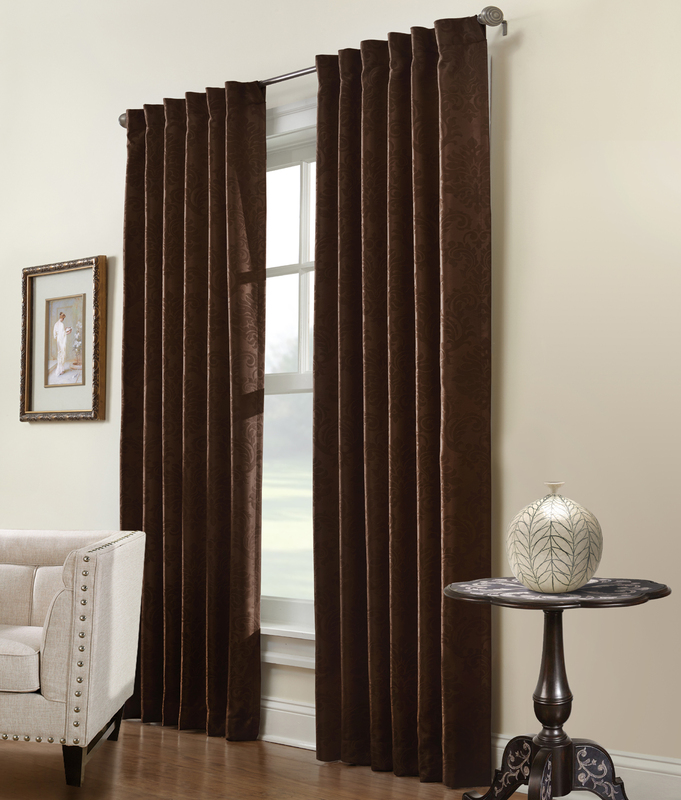 Shangri-La is an energy efficient insulated pole top curtain made of stunning faux silk Dupioni. 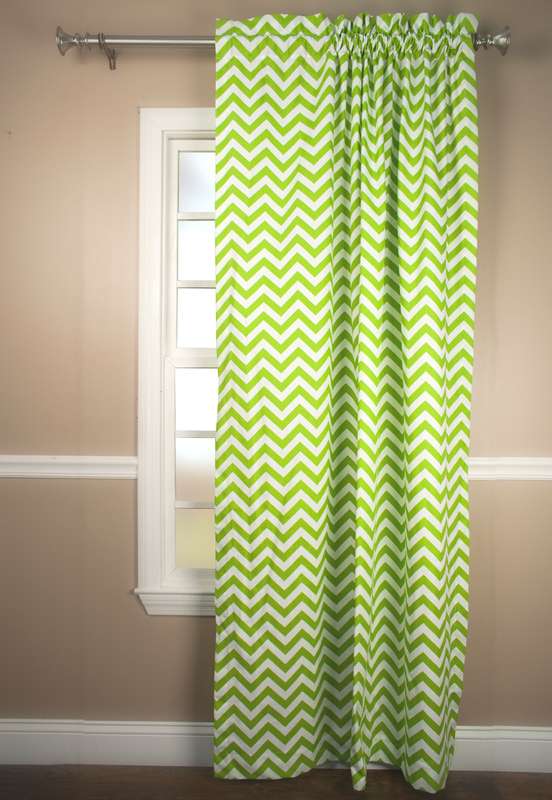 It features a 3 inch rod pocket, 2 inch header, 1 inch side hems, and 3 inch bottom hem. Each panel measures 50 inches wide and comes in lengths of 84 and 95 inches. Colors include White, Brown, and Pewter. Shangri-La keeps the warm air indoors in the winter, and cool air stay in during summer. Made of 100% Polyester on face and is backed with 100% Acrylic Suede. Washable. Panels are 68" wide to the pair, two 34" wide panels, with tie backs. Made in the USA, of 100% Cotton 7 ounce duck cloth. Panels are measured from top stitch down. 1.5" rod pocket, 2.5" header, not lined. 100% Cotton 7 ounce duck cloth. 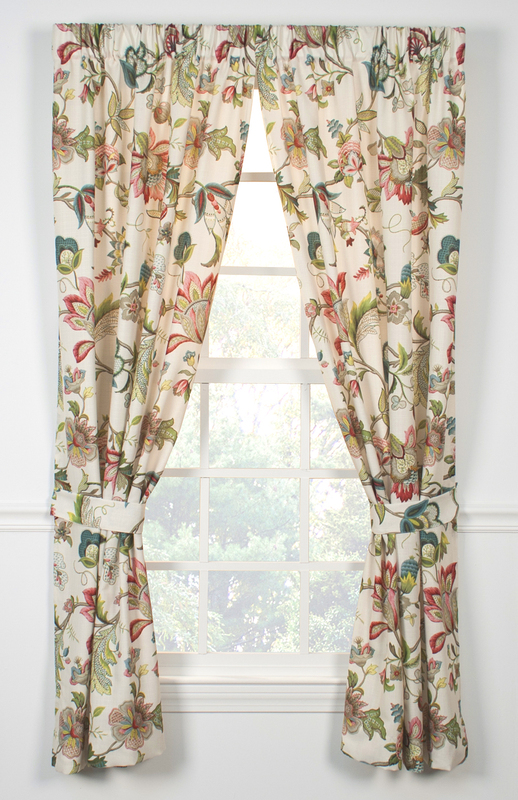 Chatsworth features a lovely traditional floral fabric design on an easy care polyester pebble beach base cloth. The Unlined Rod Pocket Pair is 70 inches wide and 63 inches long. Three color pallets are offered; Red features a pretty pink ground, Blue features an Ivory ground, and Grey has a Grey ground. Not lined, machine washable. Imported. 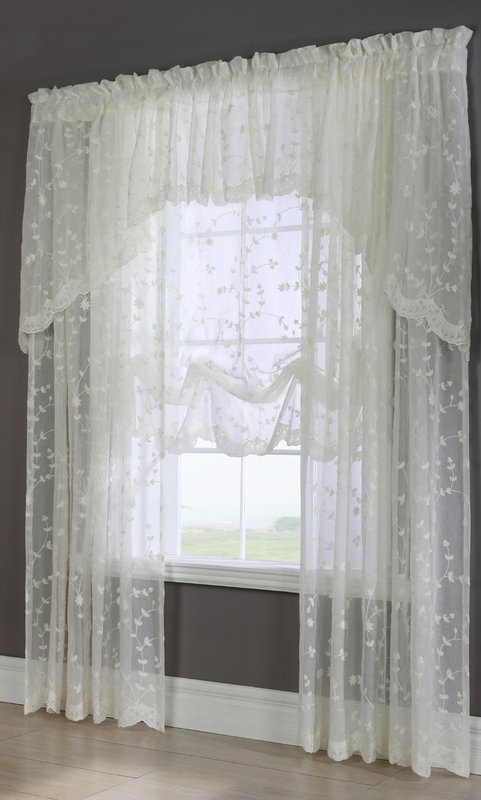 The Grandeur Window Ensemble has an intricate embroidered vining flower design on a sheer background. Made of 100% easy care Polyester, each piece features deep scalloped bottom edge, a 3" rod pocket, 2 " header, and 1" side hems. 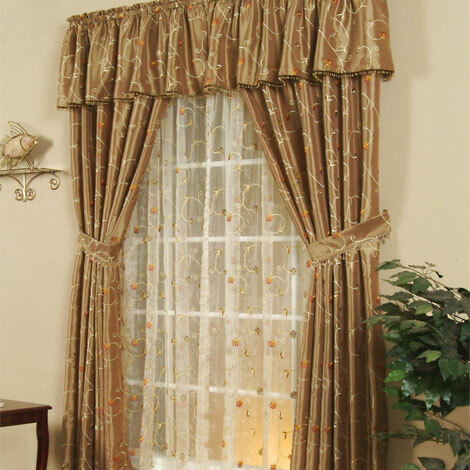 Specify Curtain Panel, Swag Pair, Valance, or Balloon Shade. 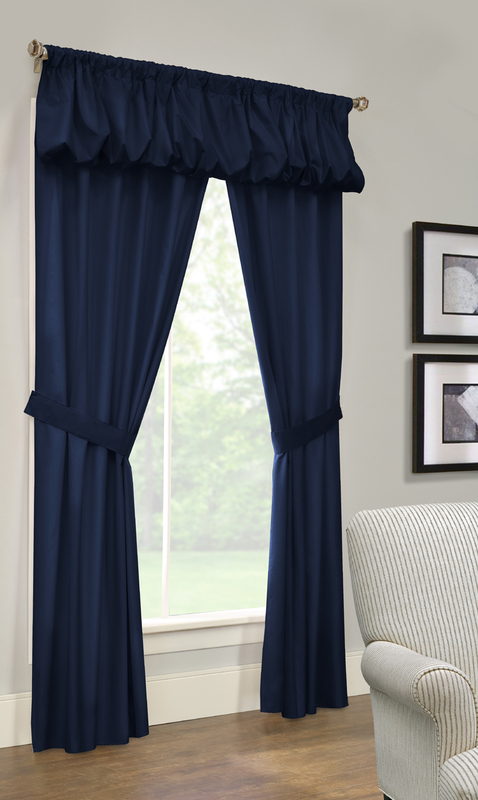 Each component is sold separately (including Tailored Curtain Panel). This gorgeous ensemble is Machine washable and imported. 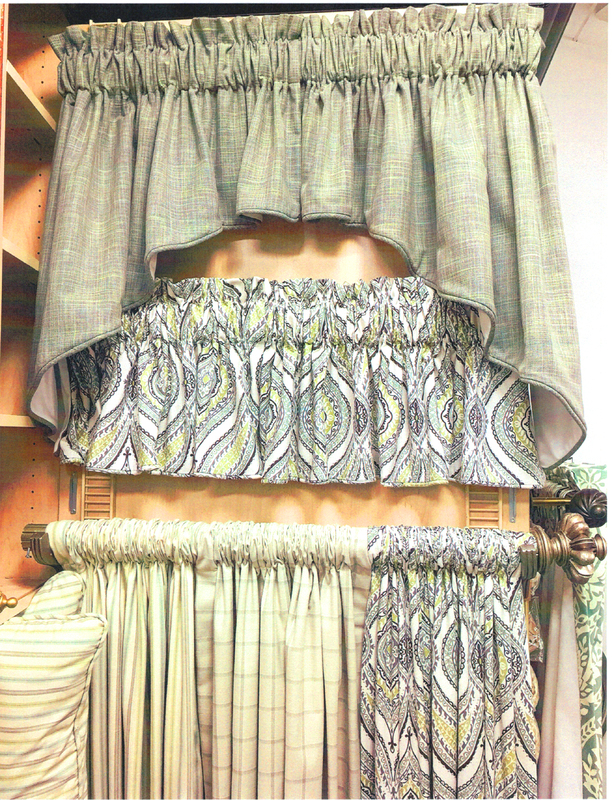 * Shown in photo is: 1 Swag Pair, 2 Valances, 2 84" long Panels, and one Balloon Curtain Panel. Enjoy the outdoors in comfort with the Nine Foot Scram Adjustable Canopy. It is used to cover your existing outdoor umbrella, table, and chair set. The fabric is infused with insect repellent that is effective in repelling all biting insects. 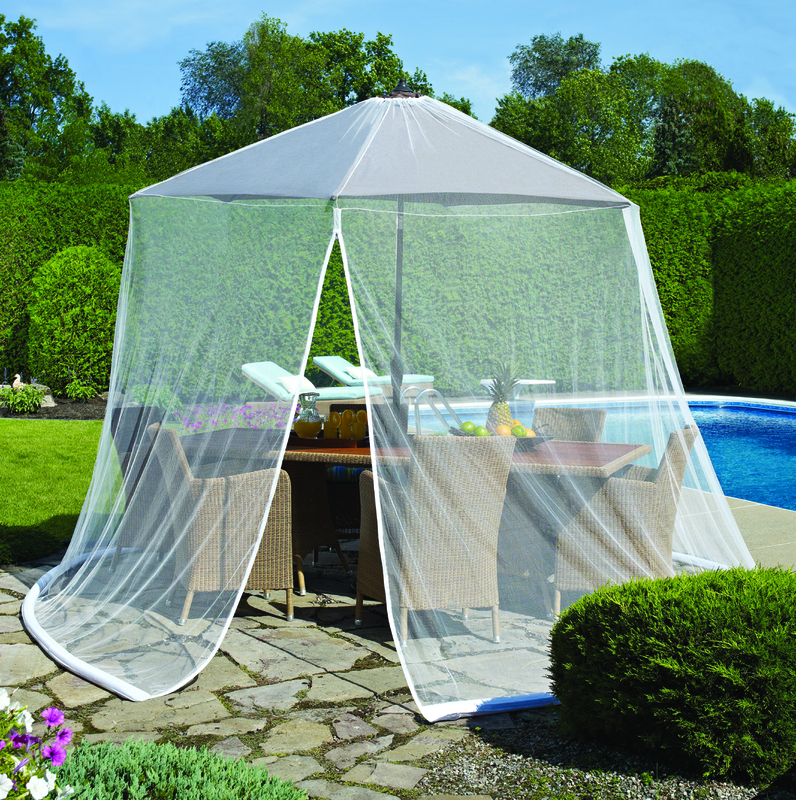 Set includes and easy to install umbrella net canopy, single entry zipper for easy access and exit. Simply fill the bottom vinyl tubing with water and close the plug. The tubing holds the umbrella in place from the ground. Use the string at the top to to adjust the canopy to the size of your umbrella. Select Black or White. 7 feet high from umbrella edge, 35 feet circumference, and 11 feet diameter. Rockport Linen features a lovely allover floral print in neutral tones. Order the Lined Valance separately. Unlined Panels are sold with tiebacks in pairs measuring 100 inches wide (two 50 inch wide panels) and sold in lengths of 63" and 84 " long. Isabella Lace by Ricardo combines the look of classic lace with an updated motif of butterflies and leafy branches. The beautiful whisper light filtering texture adds a touch of privacy to any room in you home. Isabella Lace features back tabs to gather on a decorative ord. The front features faux pinch pleated look with no pins needed. 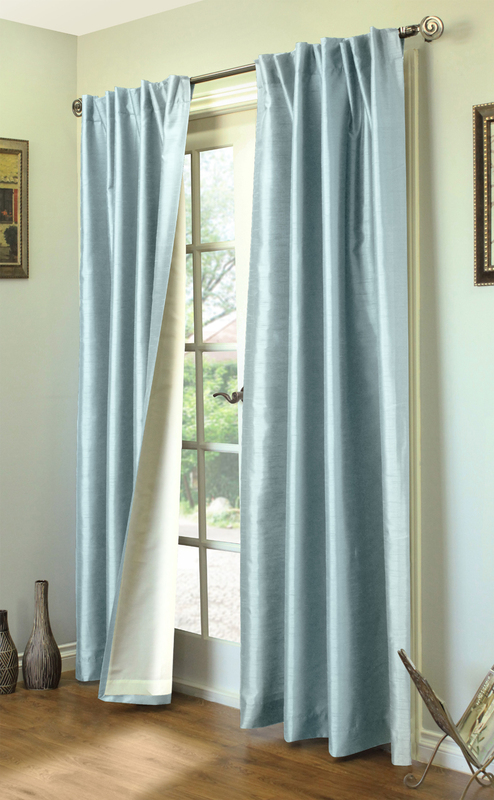 Made of 100% Polyester, this curtain panel pair may be machine washed on gentle cycle in cold water, tumble dry on low heat, and low heated iron for touch up. Love that traditional look? Ticking Stripe is a basic pinstripe on a successful "Prescott"base cloth. The Rod Pocket Panel features a three inch rod pocket with two inch header, 1/2 inch side hems, and 1/2 inch bottom hem. Ticking Stripe Pole Top Panel is fully lined with a 100% Rayon insulated cloth. The fabric face is 100% Polyester. Keep the warm air inside your hoe in winter and the air conditioning in the summer months. Each pair measures 80 inches wide and is offered in lengths of 45, 54, 63, 72, and 84 inches. Colors include Navy, Sage, and Burgundy. Tiebacks are sold in pairs and measure 44"L x 3"W at $4.98. 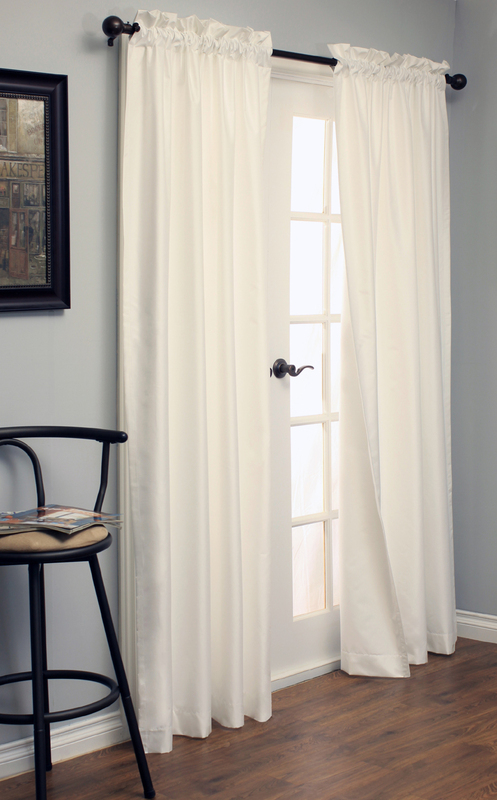 Rod pocket curtain panels are a classic home design staple that will never go out of style. 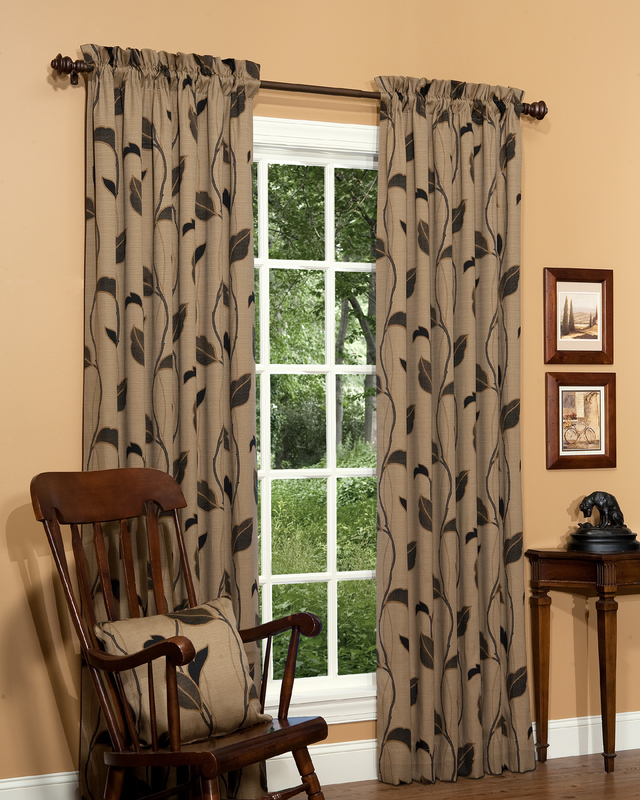 The simple curtain style features a pocket at the top of the panel that is open on either end to accommodate a slim curtain rod. 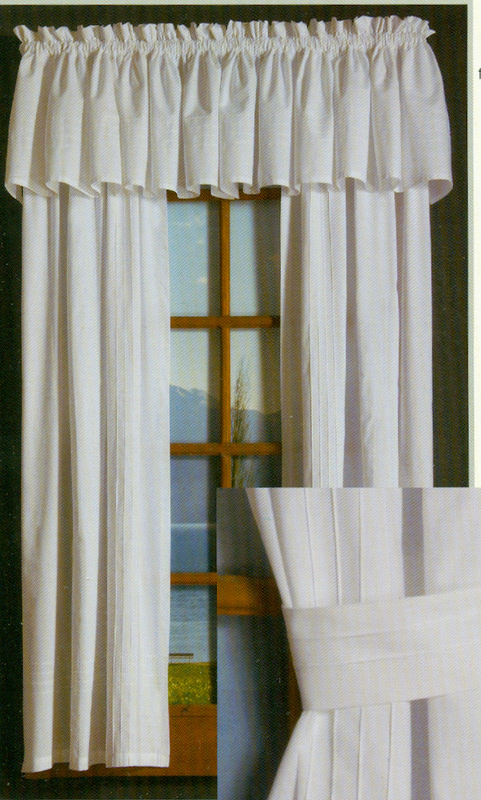 The panel covers the rod completely and is ideal for use with plain or utilitarian curtain rods. 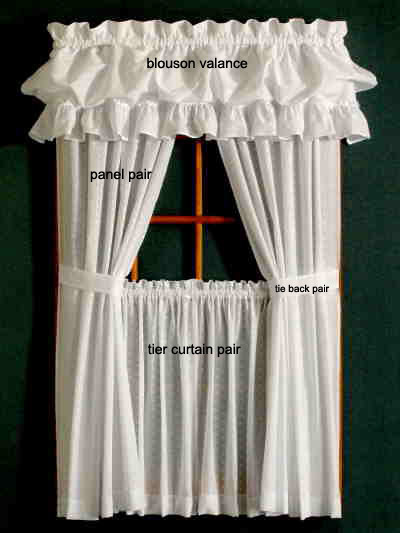 Rod pocket curtains can easily dress up a bedroom, living room, playroom, dining room or den. 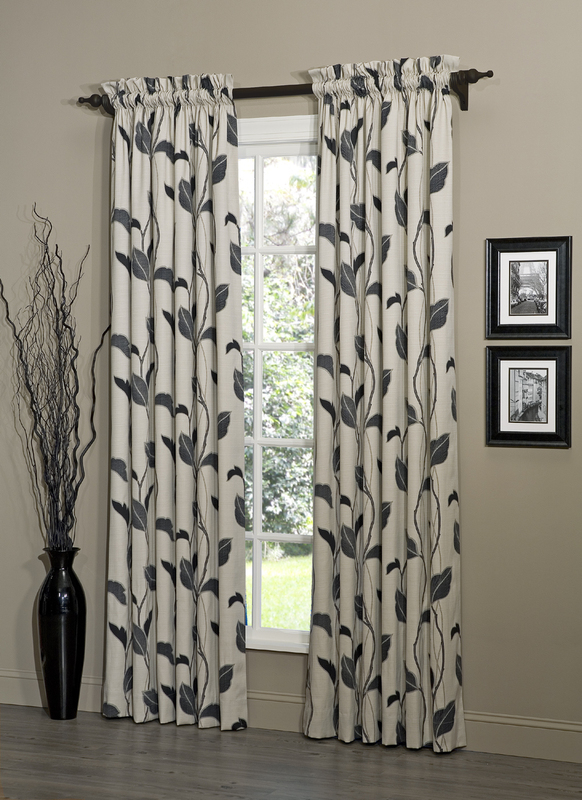 Our curtain panels come in dozens of designs to choose from including classic solids and chic prints. 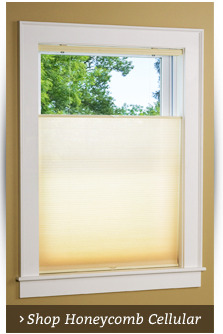 If you're looking for added privacy or light filtering, choose a double-lined panel. In bedrooms or other rooms where you want to limit the amount of sunlight entering, a double-lined panel can successfully filter the light to a comfortable level. If the double-lined panel isn't enough, we also offer an Ultimate Blackout Liner for rod pocket panels. 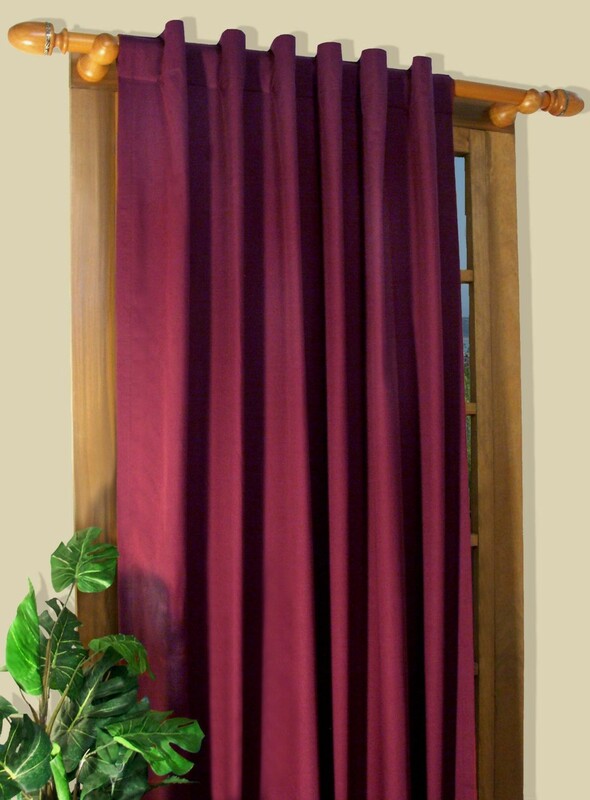 Our Ultimate Blackout Liner is an energy-efficient curtain panel that is hung behind your main panel. It helps the room stay warm in the winter and cool in the summer while protecting your carpet and furniture from fading. The liner also reduces noise from outside, which can also interfere with getting a great night's sleep. 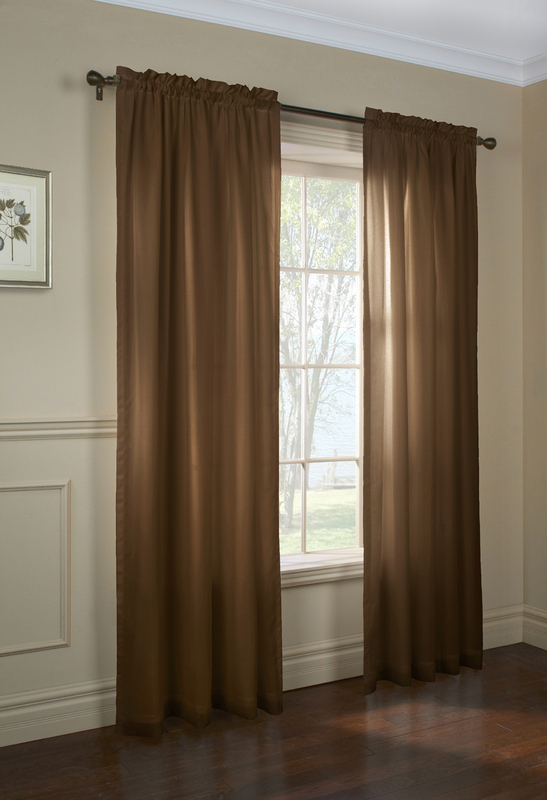 Whether you're looking for light and airy 63-inch rod pocket curtains for your living room or thicker, double-lined rod pocket shades for your bedroom, The Curtain Shop has you covered. 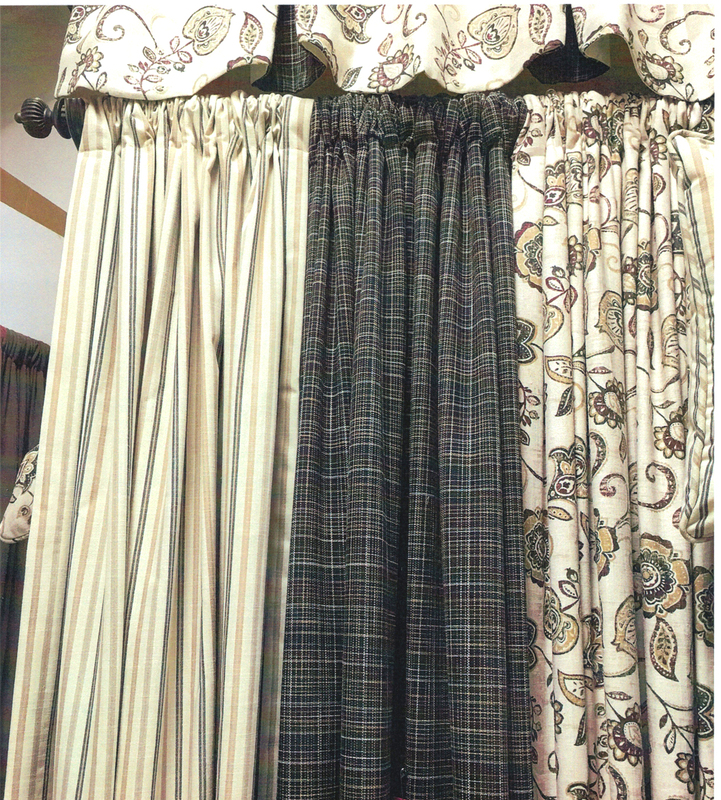 Besides a large selection of curtains, we also carry curtain rods for hanging rod pocket curtains and other accessories. 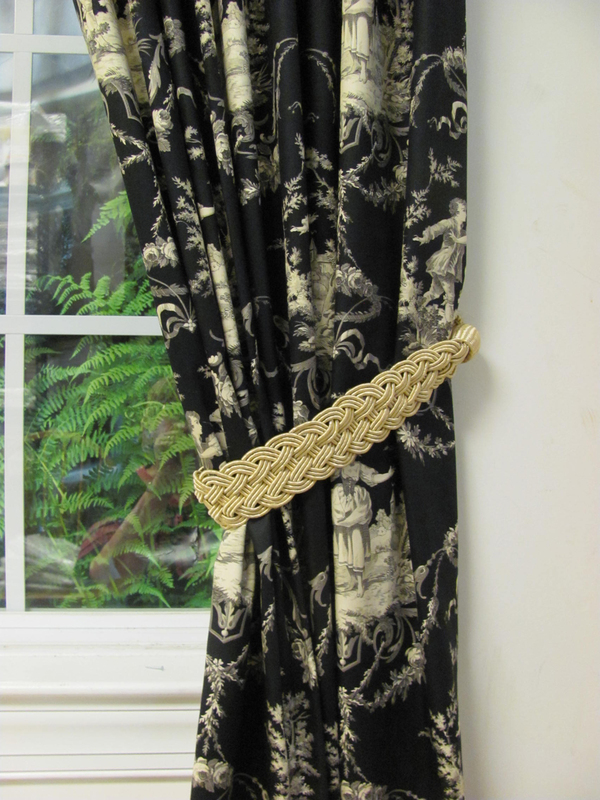 Can't find the right style of rod pocket curtain to suit your home? Our Almost Custom feature allows you to examine fabrics from many of our top designers. This made-to-order feature is available at a fraction of the cost of a regular custom order. 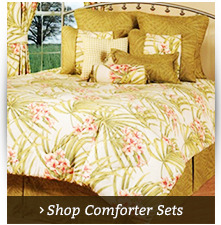 Give one of our associates a call at 1-866-886-3632 to find out more about TheCurtainShop.com's Almost Custom program.